John Huthnance, 7 Oct 2016. I joined IOS Bidston (as it was then) in October 1977. The validity of my appointment could be questioned as the appointment letter came from DB Crowder (the Bidston administrator) who left before I arrived. It was a good time to join. There were about 80 staff in total, few enough to give a “family” atmosphere with the feeling that everyone knew everyone else. Several colleagues had been taken on during the early 1970s but it was still a time of expansion rather than otherwise. Scientists like myself had a fairly free hand to pursue promising lines of research within a fairly broad remit. I enjoyed a feeling of support from fellow scientists to do just this. Much of the funding came through a consortium of several government departments with an interest in our research. The negotiations were at some distance from most of the scientists who did not have to spend much time writing proposals, yet it was good to know of “user” interest in our work, always a characteristic of Bidston science. It was still possible to be “the” expert in a topic, a rarity today. I was lucky. Everyone was expected to go to sea at least once. My first experience was a long trip in October 1978 on RRS Discovery from South Shields to Recife (Brasil)! We had calm across the Bay of Biscay but gradually increasing seas as time progressed. Green terminal screens on board added to my discomfort. It also got hot enough to affect some of the electronics and the salinometer bath struggled to maintain any standard temperature. 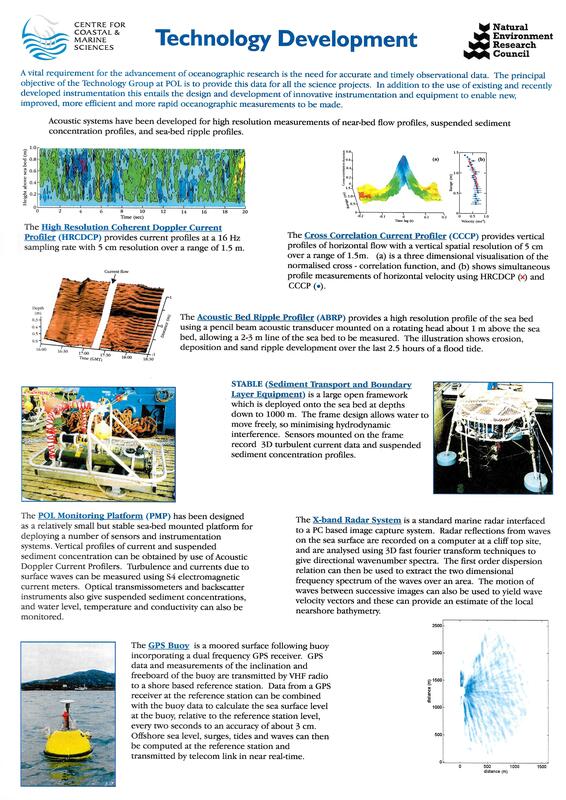 My struggles with the latter resulted in being one of many co-authors on a paper about steric height around the equator – as I discovered when the paper was published. My next research “cruise” was less exotic, to the North Sea on RRS John Murray. 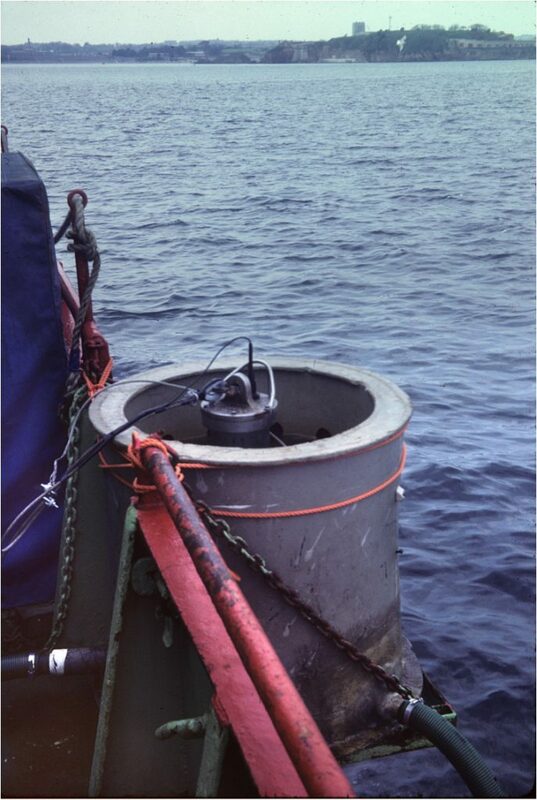 The picture shows the arrangement for under-way surface sampling – a CTD (device for measuring the conductivity and temperature of sea water at a known depth) in a bucket lashed to the side. I have seen some changes in the “style” of research – some for the better! 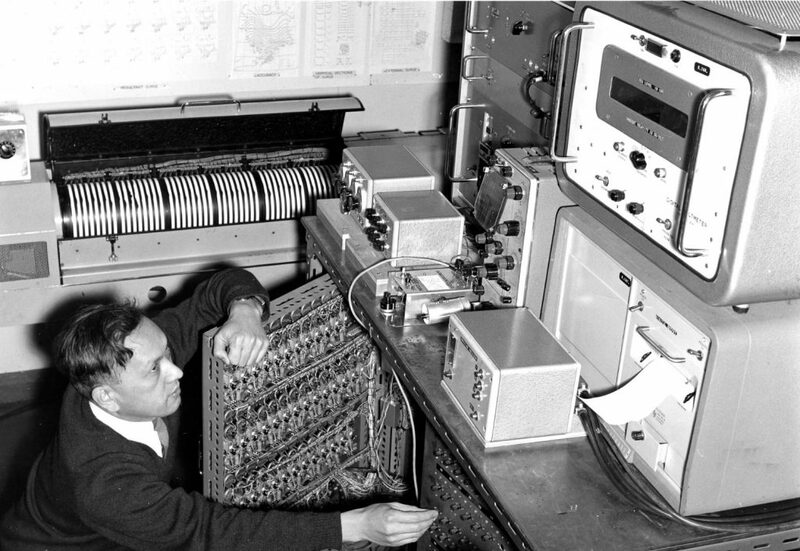 In the 1980s John Bowman (Chief Executive of NERC) told us that if we wanted students, we should get a university job. Now student supervision is encouraged (and helped by being in Liverpool). When I started, current meter data processing typically involved printing out all the recorded values. Models were semi-analytic or had reduced dimension or coarse resolution. My thesis compared a few tidal harmonic constants between measurements and a simple model. 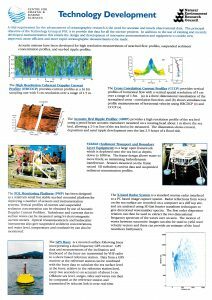 Now we have millions of observed values, billions of model output values, and we need computer programs to translate these to something viewable. In the end, science wants to compare two independent numbers for the same quantity. With the “Big Data” that modern science generates, is it harder to think what we are aiming at? Another change is towards “inter-disciplinary science”. I have been a believer in this owing to early good experience: a seminar at Bidston by John Allen (University of Reading) about sand transport gave me an idea for how sand banks might grow (I had already published about the character of tidal flow around the Norfolk sand banks). The “flip” side to inter-disciplinarity is the overhead of communication with a wider group of scientists. Anyway, Bidston (now Proudman Oceanographic Laboratory – POL) saw this in a big way in NERC’s first “Community Project”, the North Sea Project (formally 1987-1992). John Howarth and I were respectively coordinators of the monthly “surveys” (see figure) and intervening “process studies” for 15 months in 1988-89. I recall a “spat” with Philip Radford (PML) at the concluding 1993 Royal Society Discussion meeting. I showed a diagram characterised by physics-ecosystem. Philip countered with physics-ecosystem. These are of course quite compatible, differing only by which part is under the microscope. 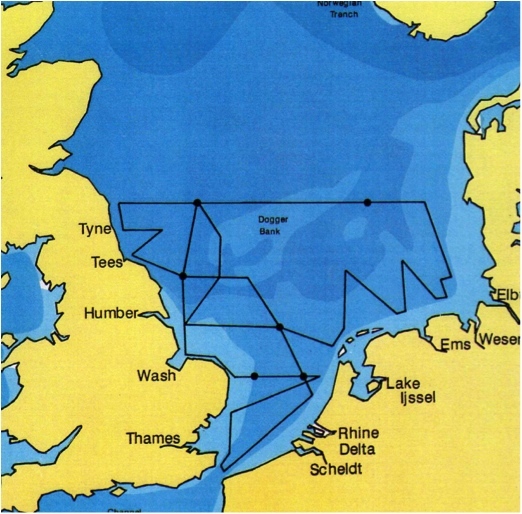 The North Sea Project was followed by the “Land-Ocean Interaction Study” LOIS in the 1990s with POL at the centre of coastal, shelf-edge and modelling studies. Such large-scale projects with many participants involved a Steering group and many rail trips to London. 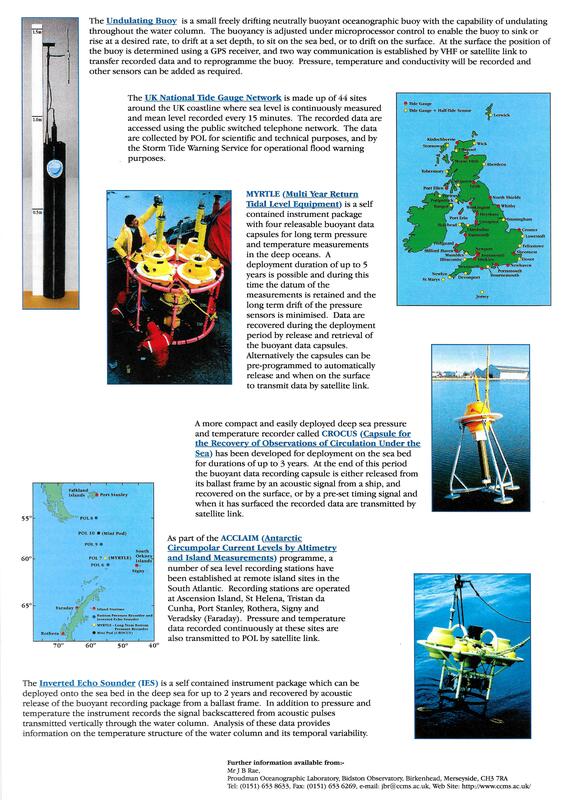 At the same time (and possibly inspired by NERC) the EU Marine Science and Technology Programme (MAST) began. My main involvement was in “Processes in Regions of Freshwater Influence” (PROFILE; two phases), “Ocean Margin Exchange” (OMEX; two phases) – both inter-disciplinary – and “Monitoring Atlantic Inflow to the Arctic” (MAIA) which somehow managed to be only physics. MAST projects had several European partners; the beaten track became the M56 for Manchester airport and flights to partners’ laboratories, EU Brussels and MAST gatherings in rather nice places (e.g. Sorrento, Vigo, . . ). After formation of Southampton Oceanography Centre SOC, there was an April 1st announcement setting up the “Centre for Coastal Marine Science” CCMS in the mid-1990s as a counterpart to SOC. CCMS incorporated PML, POL and SAMS and resulted in more trekking, to Plymouth and Oban. This was good for inter-lab communications but management went awry, especially regarding finances, and POL became “independent” again (within NERC) in 2001. 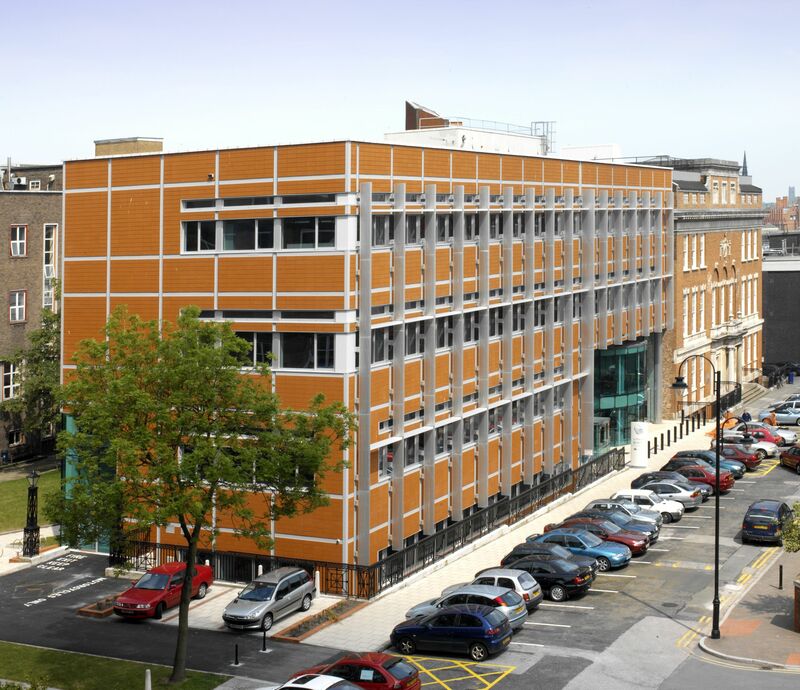 2001 was also the year of design for the new building for POL in Liverpool (pictured). There were several reasons for unhappiness about this; building down to a price, inevitable open-plan offices (being cheaper and set by Swindon precedent), more time and expense of commuting for most staff. I had the “joy” being project “sponsor”. In building procurement this does not mean having the money but rather liaison between the “owner” (NERC with the money) and the design team. I was in the architect’s Birmingham offices on “9/11”. After more than a year’s delay on completing the Liverpool building, we finally left Bidston at the beginning of December 2004. This article appeared in the Liverpool Mercury on 20th December 1866, two days before Liverpool’s astronomer, John Hartnup, took possession of Liverpool’s shiny new observatory on Bidston Hill. It makes fascinating reading 150 years later. 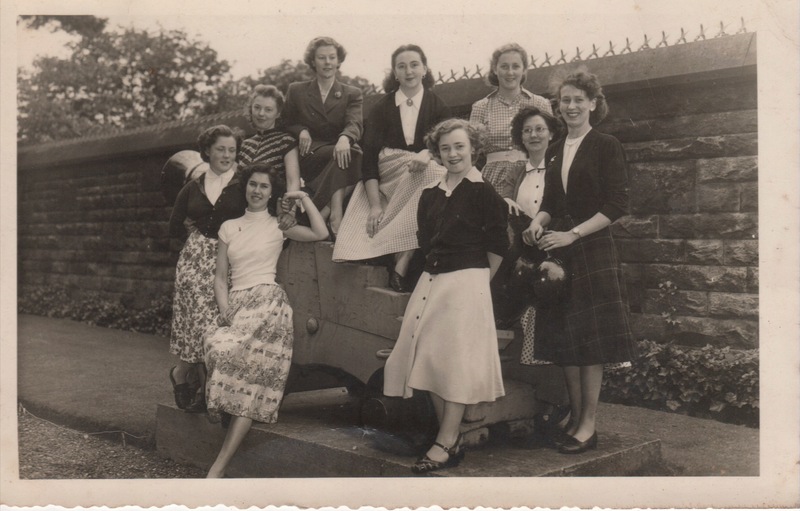 Bidston-hill has hitherto been chiefly noted for its picnic parties, and for entertainments in which ham and eggs were the principal ingredients. 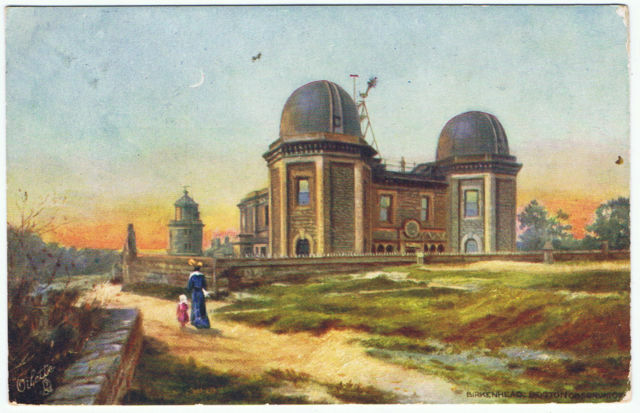 It will now acquire a wider celebrity as the site of one of the most complete observatories at present in existence – one which is certain to make the Dock Board spoken of with respect by men of science, and to render Mr. Hartnup’s position, as astronomer of Liverpool, an object of something like envy to his professional brethren. For the interests both of the port and of science, it was certainly a good thing that the space which the old observatory has occupied during the last 22 years, on the Prince’s Pierhead, was required for docks. Close to the river on one side, and the murkiest part of the town on the other, Mr. Hartnup was often in a fog, not by any means intellectually, but materially, and still more frequently had his nicest observations interfered with by the smoky canopy which overhung his post of observation. Obliged to cast about for a new site, the dock board selected Bidston-hill as the most eligible situation to be found in the neighbourhood for an observatory. The design and erection of the building were left to Mr. Lyster, the dock engineer, and he and his staff have produced a work of which they have no reason to be ashamed. Commenced in 1864, it has been gradually growing up by the side of the old lighthouse, which formerly was the sole occupant of the height, and now with its two domes and picturesque outline, stands out as a prominent feature in the landscape. The transfer of instruments from the old observatory has been for some time in progress, and at the beginning of next year Mr. Hartnup will probably be able to resume his labours – made still more important by this change – under conditions more favourable than he has yet enjoyed. Externally, the new observatory has a bold and massive appearance, which accords with the position in which it is placed. A building perched alone at the summit of a hill is in danger of looking insignificant from one or other points of view, but Mr. Lyster has so well arranged the different fronts that from all aspects an effective grouping is presented. Two domes, springing from octagonal towers at the east and west extremities of the south front, are prominent features of the building. Beneath one is the “equatorial”, for making astronomical observations, and beneath the other an instrument called the transit. The domes enclosing these instruments have apertures at several points, and are made to revolve, so that observations can be taken in any part of the heavens. The substantial character of the whole building strikes the observer at once. It is founded upon a rock, and if the waves as well as the winds could come to Bidston-hill, Mr. Hartnup’s castle would not be likely to fall. Strength and solidity are characteristics of Dock Board work, but there are special reasons for making an observatory, from foundation to summit, firm and secure as builders’ skill can contrive. Some of the operations carried on are so delicate that the variation of almost a hair’s breadth would seriously affect the results, and hence the utmost precautions have been taken to avoid the vibration to which all but the most substantial buildings are liable. A deep foundation excavated out of the solid rock and thick stone walls to form the superstructure were not considered sufficient to secure perfect immovability, and to prevent all possibility of vibration from anything short of an earthquake the building has been insulated from the surrounding rock to the depth of 12 or 14 feet by a trench about 18 inches wide. Even this has not been deemed a sufficently stable basis for the transit. That instrument is located immediately beneath the dome at the south-east angle of the building. It is used for taking the time, fixing the latitude, and determining the declination of the stars. These operations require the utmost accuracy of observation, and consequently the most perfect steadiness of position. To support the instrument a huge pillar, nine feet in diameter, has been carried up from the solid rock to the floor immediately beneath the dome, and this pillar, though passing through several floors, and apparently in contact with them, actually touches the building at no part. In other respects, the thorough adaptability of the building to the purpose for which it is intended has been studied. In many of the processes uniformity of temperature is very necessary, and towards securing this lofty cellars have been excavated in the basement, where an efficient heating apparatus, communicating with all the apartments in the building, is situated. The other internal arrangements are in a corresponding style of completeness. There is a fine chronometer room 36 feet long by 21 feet abroad; an anemometer room and a library, each 18 feet by 21 feet; a computation room; and, in short, every provision for carrying on efficiently the work belonging to an observatory. The northern portion of the building forms the private residence of Mr. Hartnup, and in reference to the arrangements of which it need only be said that the comfort and convenience of its occupant have been consulted in every particular. Observations are regularly taken with the transit instrument, for the purpose of ascertaining the local time. From the local time so obtained, the Greenwich mean time is deduced and communicated to the port daily by the dropping of the time-balls at the Observatory and at the Victoria Tower. The clocks at the Victoria Tower and Town Hall, and also the seconds clock seen from the Exchange flags, are controlled from the Observatory. The other public clocks on the dock estate are regulated twice each week, and a record is preserved showing their errors at the time they were regulated. The velocity and direction of the wind, and the fall of rain, as derived from the self-registering anemometer and rain-gauge, are tabulated for each hour of the day, and hourly readings are taken from the tracing produced by the self-registering barometer. The results thus obtained are tabulated, and the mean reading at each hour of the day is taken at the end of every month. The ordinary meteorological observations obtained by means of the standard barometer, thermometers, hygrometers, &c., are taken at eight and nine a.m., and at one, three, and nine p.m. daily. A telegram containing the corrected readings of the barometer, wet and dry thermometers, strength and direction of the wind, and general state of the weather for the proceeding 24 hours, is forwarded daily at eight a.m. to the Meteorological Department of the Board of Trade. Weekly meteorological observations are forwarded to the Mersey Docks and Harbour Board, and to the medical officers of health for Liverpool and Birkenhead. Monthly and weekly meteorological observations are forwarded to the Registrar-General of Births, Deaths and Marriages; and a tracing of the record produced by the self-registering barometer, together with an account of the hourly strength of the wind, &c., are supplied daily to the Liverpool Underwriters’ Association. 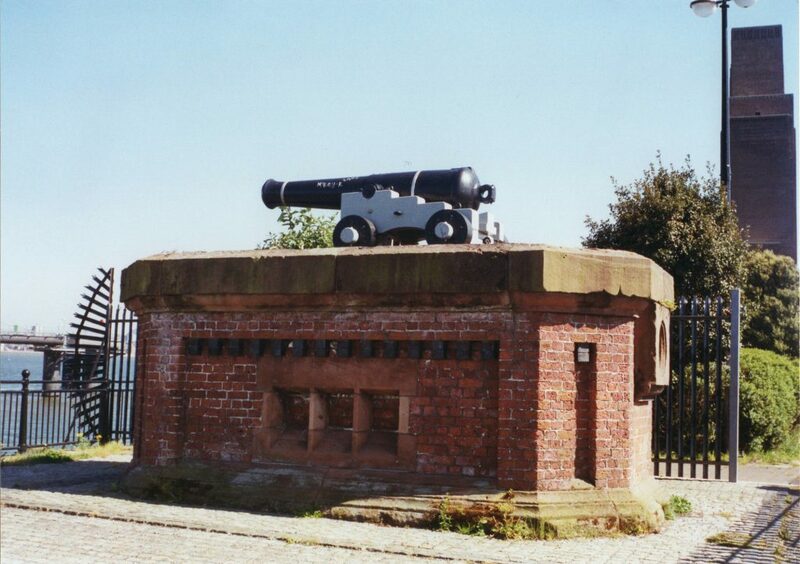 The value of the observatory in keeping an exact record of time is shown by the fact that in Liverpool there are, on an average, upwards of 2000 chronometers dependent on the time disseminated from the observatory for their errors on Greenwich mean time, and of their daily rates obtained while the ships to which they belong remain in port. Now that the observatory has been removed to Bidston, it is possible that the time-balls will give place to a time-gun, which is found to possess several advantages over the ball. 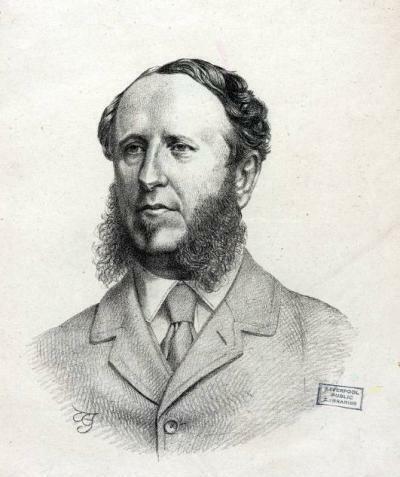 With regard to meteorological observations, their importance is every year becoming more largely recognised, and during the last 20 years Mr. Hartnup has contributed not a little to the advance which this department of science has made by his carefully compiled tables of results. All chronometers received at the Observatory are compared daily with the normal clock, which is kept as nearly as possible to Greenwich mean time. From subsequent astronomical observations, the daily errors of this clock, at the times of its comparison with the chronometer, are deduced, and the correction for each day, thus obtained, is applied to the daily comparisons of all the chronometers. In this way the error of each timekeeper is found daily, with as much accuracy as it is well possible to attain. The temperature in a glazed chamber is kept, by artifical means, between 50′ and 85′, and changed weekly 10′ or 15′, in order to show the change of rate that may be expected on going from a temperate to a tropical climate. The record supplied to the captain or owner of each chronometer, contains its error on Greenwich mean time for each of the first few days; and subsequently it is given at the end of each week, together with the mean daily rate, the temperature to which the instrument has been exposed, and the greatest variation of rate between any two days in each week. The corrections for imperfect adjustment are sometimes found to be so large or so irregular as to render it troublesome or difficult to apply them all efficiently, and in such cases the record becomes a serviceable guide to the maker, as it directs his attention to the peculiar fault, and often enables him to make the necessary adjustment at once. It is rather puzzling to be told that the wind is made to register its own velocity, force, and direction; that the quantity of rain which falls is measured and recorded without human interference; and that the atmosphere marks its own variations on a sheet of paper. Yet all this is done by means of the anemometer, rain-gauge, and barograph – contrivances as ingenious as they are effective. Any one who has been in the neighbourhood of the observatory must have observed on the roof a sort of horizontal windmill, consisting of four hemispherical cups. These serve the double purpose of keeping a four-feet pressure plate facing the wind and turning the shaft which runs through into the room where the anemometer is situated. This shaft, by an ingenious contrivance, regulates the motions of a pencil placed in contact with a sheet of paper stretched round a slowly revolving cylinder. The sheets of paper which receive the record made by the pencil are divided by vertical lines into spaces equal to the hourly motion of the cylinder, and by horizontal lines into other spaces, representing the pressure of wind per square foot. The barograph, or self-registering barometer, has been in use about three years, and the Liverpool Observatory is the only institution which possesses an instrument of this character. It was invented by Mr. Alfred King, of this town, and shows great ingenuity of construction. In the ordinary barometer the variations in the atmospheric pressure are indicated by the varying height of a column of mercury within a tube; in the floating barometer these variations are made evident by the movements of the tube itself, and its changes of position are recorded in a somewhat similar manner to that adopted in connection with the anemometer. There are various other interesting features connected with the observatory, but we must bring this notice to a close. In many respects, the establishment of the new observatory is an important event, and there can be no question that Mr. Hartnup will turn to good account the increased advantages he will possess for carrying on his useful labours in the fine institution placed under his charge.